Click the link to view detailed instructions. Click Accounts and click Ad Accounts. On the right side of the page, click the + Add button. 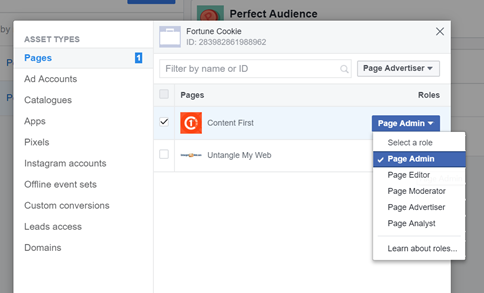 If you are currently using Facebook’s Business Manager but you’re new to Facebook advertising, then first step is provide Content First access to your Business Manager. Once that’s done, then you’ll need to setup a new Ad Account, link that to your Business Manager and then provide us access to this new Ad Account. Note: All new businesses are able to create 1 ad account. Once there is active spend on your ad account, you can host a maximum of 5 ad accounts. There's currently no option to request additional ad accounts. Navigate your Business Manager menu to find Settings and click. Fill in all the blanks by entering your company’s name, address, and other relevant information. Enter your Credit Card or PayPal information, then hit Continue. You should now be all set. 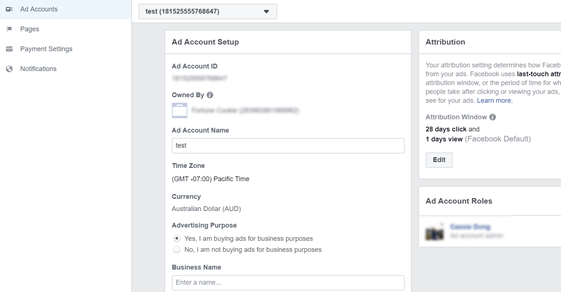 If don’t have Business Manager setup but have done advertising on Facebook before it means you are still use the legacy Ads Manager interface. If that’s the case, follow the steps below to provide us admin access to your Page as well as your Ad Account. Login to the Facebook account that gives you admin access to your Facebook page. Click Settings at the top of your Page (not the settings of your personal profile). Click Page Roles in the left column. Type "facebook@contentfirst.com.au" or "Adam Fasttrack" in the text box and click Editor to select "Admin" from the dropdown menu. Click Save and enter your password to confirm. Once you’ve done the steps above we will receive a notification, at which point we will accept the invite to become an admin of your page. Important: if you own multiple pages, please repeat the steps above to add us to EACH page. Add Content First’s Facebook account as your Facebook friend. 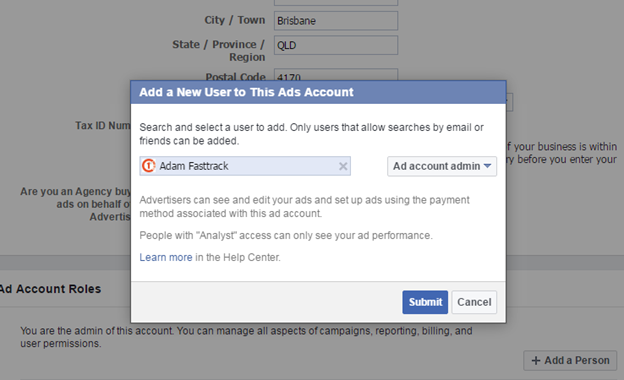 Find us by searching for “Adam Fasttrack” in the search bar and request to add us as your Facebook friend. Select Ad Account Admin and click Submit. If this is the first time that you advertise on Facebook and you don’t have Business Manager setup, we highly recommend that you have one setup. You can follow the steps here to sign up for a Business Manager account. Once that’s done, please make sure to follow the steps here to claim your page (if you have one currently) so your page is linked to your Business Manager. 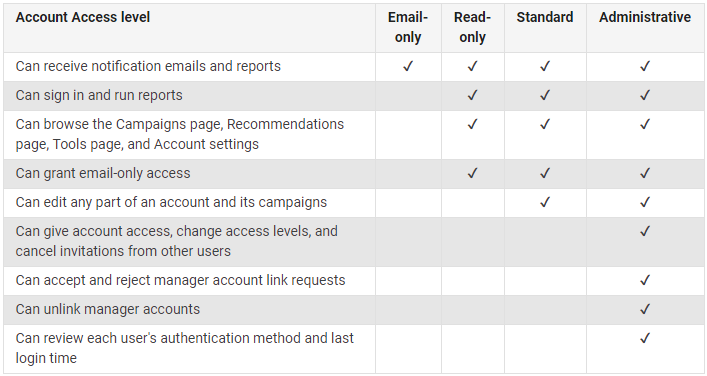 Once that’s done, follow the steps in Section B to provide us access to your Business Manager and setup your Ad Account. Option #2 - We set it up directly under your Facebook account in which case we’ll need the login to your Facebook. You can change your password later or share your login using a password sharing tool such as LastPass. Please indicate which option you prefer in the email and provide relevant login access. Provide us the username and password of your Facebook account so we can look into this for you. You can change your password later or share your login using a password sharing tool such as LastPass. Follow the steps in Section C to provide us access to your Facebook Page and your Facebook Ad Account. To give us access to your Google Ads account you will need to share your Customer ID. Sign in to your Ads account. Look in the top right corner of any page. Find "Customer ID" above your email address. Click the help icon in the top right corner. Find "Customer ID" at the bottom of the menu. Owners have full control over properties in Search Console. They can add and remove other users, configure settings, view all data, and use all tools. If you want to give someone more limited permissions, add them as a user instead. Choose a property in Search Console. Click the gear icon , then select Users & Property Owners. Click the Manage property owners link. In the Verified owners section, click Add an owner. Note that any owners you add are actually delegated owners, not verified owners. Type the email address of the owner you want to add, then click Continue. The new owner can now add the new property to their Search Console account, where it will be automatically verified. You cannot permanently delete a verified owner (someone who as verified their ownership of a property), only a delegated owner, unless you also remove the verified owner's token from the source (for example, remove the HTML tag from the page or the token from the app manifest). In the Verified owners section, click Unverify next to the owner you want to remove. The change should take effect very quickly. A property can have a maximum of 100 full or restricted users. Click Add a new user. Type the email address of the user you want to add and select the type of user. The property will be added to the new user's Search Console account automatically. Select the user to delete and click Delete. The change should take effect very quickly. If someone wants to associate with your Search Console website you will get a request with instructions emailed to you about how to add the associate. Click the gear icon , then select Associates. Select the associate to delete and click Delete. The change should take effect very quickly. Step 1. Sign into Google Webmaster tools at Google.com/webmasters. Once signed in you'll see your site, or a list of websites that have been verified using Google Webmaster Tools. Step 2. Click the Manage Site Button and Choose Add or remove Users. A list of Users and Site Owners will appear. 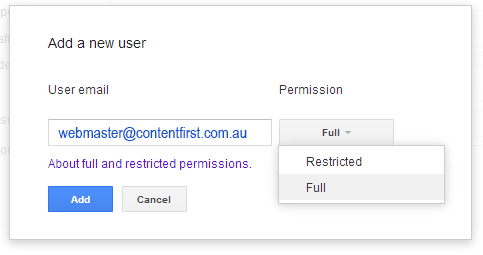 There are two types of users that you can add to your Google Webmaster Tools account: Restricted and Full. Site owners always have complete control over all settings in Webmaster Tools. A Full user can change most settings and take most site actions like submitting a new URL to Google's search index. Restricted users in Google Webmaster Tools are generally restricted to view only permissions. Be Careful of who you give full access to. 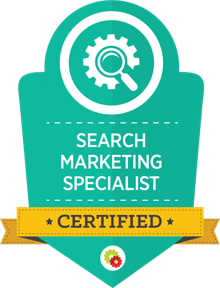 Google Webmaster Tools are powerful and can have a significant impact on improving or ruining your Website's performance. Step 4. Enter the User's Email, Select the Permission level and click Add. Sign in to your Google Ads manager account. Click the tool icon in the upper right corner of your account. Under “Setup,” click Account access. Find your email address and check the "Access level" column. Click the plus button . Under “Accounts,” your manager account is selected by default as the account that you’re inviting users to. If you’re an administrative owner of other accounts, you can click the drop-down menu to invite users to other accounts you manage. Enter the new user’s email address. You’ll see your invitee under “Pending invitations” in the “Users” page under “Account Access.” Your invitee will need to accept your invitation and create their own Google Ads sign-in using the email address you sent the invitation to, or another of their choosing. You'll be notifed when your invitee responds. Under “Setup,” click Account access.You’ll see “Pending invitations,” if there are any. Under “Setup,” click Account access. Beneath “Pending invitations” (if you have any), you’ll see a list of users with account access. Under “Setup,” click Account access. Beneath “Pending invitations” (if you have any), you’ll see a list of users with account access. Find the user that you want to change the access level for. In the “Access level” column, place your cursor the current access level for the user. Click the drop-down arrow and select a new access level. Under “Setup,” click Account access. Beneath “Pending invitations” (if you have any), you’ll see a list of users with account access. Find the user that you want to remove from your manager account. In the “Actions” column, click Remove access. Click the gear icon in the top corner of your manager account and choose Account settings. Click Account access from the side navigation. Your invitee will need to accept your invitation and create their own AdWords sign in using the email address you sent the invitation to, or another of their choosing. They won’t be able to use an email address that’s already associated with an AdWords account. We’ll notify you when your invitee responds. After accepting the invitation, they will also need to confirm the email address. After the invitee has accepted and confirmed their email address, you must confirm and grant the invitee access to your account. To do this, click the gear icon in the top corner of your account, then click Account settings. Click Account access from the side navigation and confirm their access to your account by clicking Grant access. Click Account access from the side navigation.You’ll see any “Pending invitations,” if there are any. To revoke or resend a pending invitation from here, click the Actions drop-down menu in the “Pending invitations” section and choose either option. Sign in to your manager account. Click the gear icon in the top corner of your manager account and select Account settings. In the "Users with account access" section, click the download icon. Select your file format from the drop-down menu and click Download. 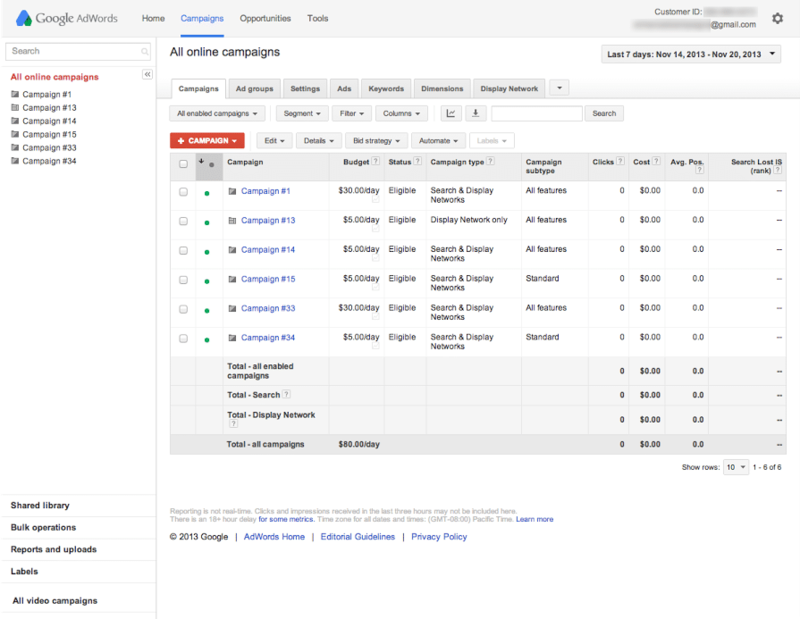 Sign in to your AdWords manager account. In the "Users with account access" section, find the user email address for which you'd like to change access levels. In the “Users with account access” section, click the Actions drop-down menu and choose the option. Back to "Invite a User to a Manager Account"
Send your Partner your generated link as soon as possible. Assign your partner either the Pixel Editor or Pixel Analyst role. These are the tools & third-party applications you need to have access to in order to complete and maintain this sub-system or work instruction. Make sure there is an existing verified Instagram account. If you'd like someone to be able to promote on your Instagram Business Profile, you'll need to give them a role on the Facebook Page that's connected to your business's Instagram account. 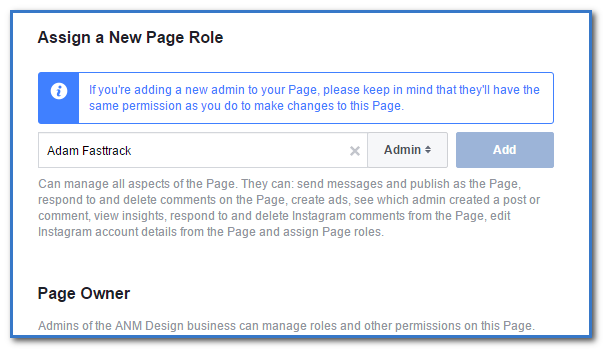 Before you are able to give someone a role on a page, you'll need to be an admin of that page. Click in the top-right corner. Click All Tools and select Ad Account Settings. 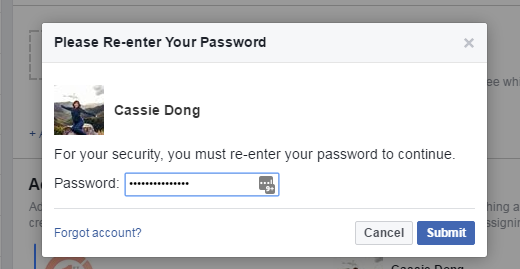 You may be asked to re-enter your password. Scroll to the Ad Account Roles section, click Add a Person and then enter webmaster@contentfirst.com.au. Use the dropdown menu to choose Advertiser and then click Submit. Note 1: Adding people to your advertising account doesn't give them permission to log in as you or see things on your profile or Feed that you haven't shared with them. Note 2: If you use Business Manager to manage ad accounts, you'll need to assign ad account permissions in Business Manager. Learn how to add people to your ad accounts in Business Manager. After logging in to the account, Content First will need to confirm identify and prompted to do this the first time we try to promote. Owners of listings can invite additional users to own or manage a listing. Adding owners and managers lets users share management of a listing without having to share personal account information. Only an owner can add or remove users. However, a manager may remove himself or herself from a listing. Google Groups can't be added as managers or owners of listings. Sign in to Google My Business. If you have multiple locations, open the location you'd like to manage. Click Users from the menu. In the top right corner, click the "Invite new managers" icon . Select the user’s role by choosing Owner, Manager, or Communications manager. Click Invite. Invitees will have the option to accept the invitation and immediately become listing owners or managers. This window displays all active owners and managers, as well as people who have been invited to become owners or managers. You can cancel pending invitations by clicking the X in the row with the invitation you want to remove. Open the Google My Business app. Tap the three dash menu icon in the top-left corner. Tap the plus icon + in the top-right corner. Enter Content First's email webmaster@contentfirst.com.au, then tap the plus icon + to the right of their name. Select their role by tapping Owner, Manager, or Communications manager in the menu that appears. This page displays all the active users as well as people who have been invited to become owners or managers. You can cancel pending invitations by tapping the three dot menu icon next to the invitation you want to remove, then tapping Remove . You can also change a the role of a user by tapping the three dot menu icon next to their name and tapping Edit role. Select their new role by tapping it in the menu that appears. Look what you've gone and done. When an invitation is accepted, the owners of the listing will be notified via email. All users in the account can view the names and email addresses of the owners and managers of the listing. Click the X in the row of the person you'd like to remove. You're trying to remove the primary owner from the listing. Transfer primary ownership to someone else, then remove the user from the listing. Tap the three dash menu icon in the top-left corner . Tap the three dot menu icon next to the name of the user you'd like to remove, then tap Remove in the menu that appears. Tap OK to remove the user from the listing. When a user is removed, they'll be notified via email. When you remove a user, that person will no longer be able to edit business information or take any administrative actions for the listing. However, all of their past responses to reviews, posts, comments, and other actions will remain intact. Then click on Managers and you will see a list of pending invitations. Then in action column on the right accept the invitation. 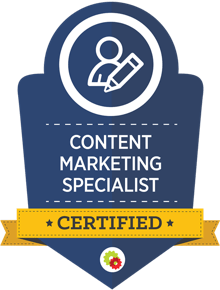 "...We have seen exceptional growth in lead generation from our online sources due to Content First's knowledge and expertise and the traffic being driven to our site has never been better... We highly recommend any business wishing to improve their online marketing business to get in touch with the team at Content First." 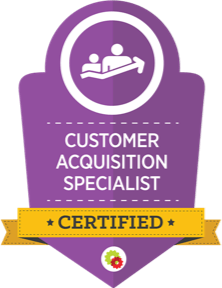 "It was a pleasure working with the guys at Content First. Well organized and great communication." "...I would just like to say a massive THANK YOU for all your hard work to date! The last 6 months have been very hectic and your team have pulled off launching two websites, two CRMs and maintained our digital media strategy! Your customer service and communication is professional, prompt and also friendly and very helpful. Please spread the gratitude to your team for their amazing work and I look forward to continuing working with you all as we go from strength to strength!" 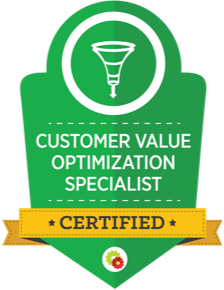 "Adam provided some excellent advise on google adwords and SEO strategies for my new mortgage business. Excellent digital marking strategist. Highly recommended." "...We've been working with Adam, Cassie and the team at Content First for the last 5 years. Over this time we've seen our leads increase across every channel YOY including AdWords, Facebook, Content Marketing & SEO. We're getting a great conversion rate on our landing pages and the CRM automation and Xero integration have streamlined how we operate. I sometimes have to remind myself that these guys are not our own internal marketing team, it's that seamless." We can only take on limited clients, so apply for a free proposal today. © Content First Pty Ltd.